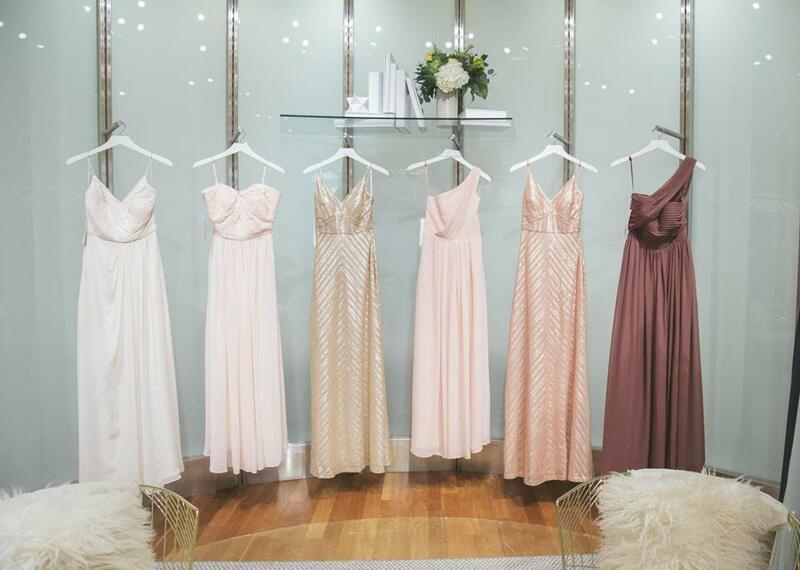 A better way to buy a bridesmaid dress? Weddington Way is a bridesmaid e-commerce brand. For generations, shopping for bridesmaid dresses meant dragging your attendants to a formalwear store where they could browse racks of Creamsicle-colored chiffon and aquamarine tulle before shelling out big bucks for a dress they would definitely never wear again. But in the last decade, the bridesmaid dress business was upended with the introduction of lower-priced, mass-market options from the likes of J.Crew and Ann Taylor. They helped shift the trend to more mix-and-match styles with shorter lengths — and functionality. While those brands found success with their dresses, in the last two years they have pulled back on offering bridal attire, in part due to outside financial woes. That’s provided an opening for Gap Inc., which acquired the bridesmaid e-commerce brand Weddington Way for an undisclosed amount last year. The company features a “virtual showroom” where brides and their far-flung friends — many of whom may be unable to convene for an in-person try-on session — can share and compare styles. Now Weddington Way is establishing a brick-and-mortar footprint, and will open its first Boston-area boutique inside the Banana Republic at the Natick Mall on Wednesday. The company’s founder, Ilana Stern, started Weddington Way after spending years as a buyer at Bloomingdale’s, where she fielded requests from brides struggling to find dresses for their attendants. The original concept for the website brought together 15 top dress designers and offered more than 40,000 styles. But Stern quickly realized she was only adding to the bridesmaid dress problem. “It was almost like when you go into the Cheesecake Factory and you don’t know what to order,” said Karishma Baijal, the company’s head of customer experience. Weddington Way eventually took what it learned about the best-selling dresses on the site, and created its own line that focused on breathable fabrics, functional additions like pockets, and a price-point that hovers at about $150. In 2016, the company got rid of outside labels and now only carries its own designs, Baijal said. The in-store experience echoes the online: Once a bride sets up an appointment with her friends, they can expect to find the dresses they’ve selected on hand when they arrive. In some instances the stores have experimented with offering Skype sessions for people who may not be able to attend an appointment in-person. The result was The Little Details, Steele’s organizing company, which aims to make sense of its customers’ lives, be it cleaning out closets, working to make corporate offices more efficient, or helping to manage digital clutter. Steele now has five employees and last week opened her first organizing studio at 2255 Mass Ave. in North Cambridge. She said her shop is the first of its kind in the state. It may have been the worst-kept secret in the city, but it’s now official: Chef Andy Husbands will open his third outpost of The Smoke Shop BBQ restaurant at Assembly Row this spring. The restaurant brings the anticipated number of new leaseholders in the “Phase 2” build-out of the Somerville shopping mecca to 10 for 2018. Polo Ralph Lauren also just announced that it will open a 10,000-square-foot factory store in the complex, and Assembly Row will also get its first hotel this summer — an Autograph Collection by Marriott. Have an idea for Talking Shop? E-mail Janelle Nanos at janelle.nanos@globe.com. Follow her on Twitter @janellenanos.